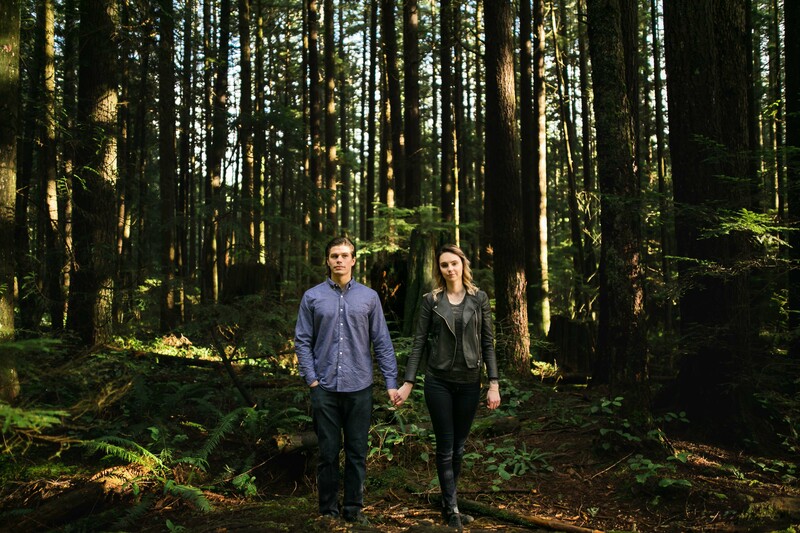 Spring – As the world shakes off the muted winter months and emerges into the vibrant tones of warmer seasons, let the blossoms of new life inspire your engagement shoot look. Bold warm colors, think reds and yellows, are perfectly suited for a spring shoot. Compliment bold color choices with simple silhouettes, like Shay’s sweet little red dress, and have some fun incorporating one statement color into both outfits. 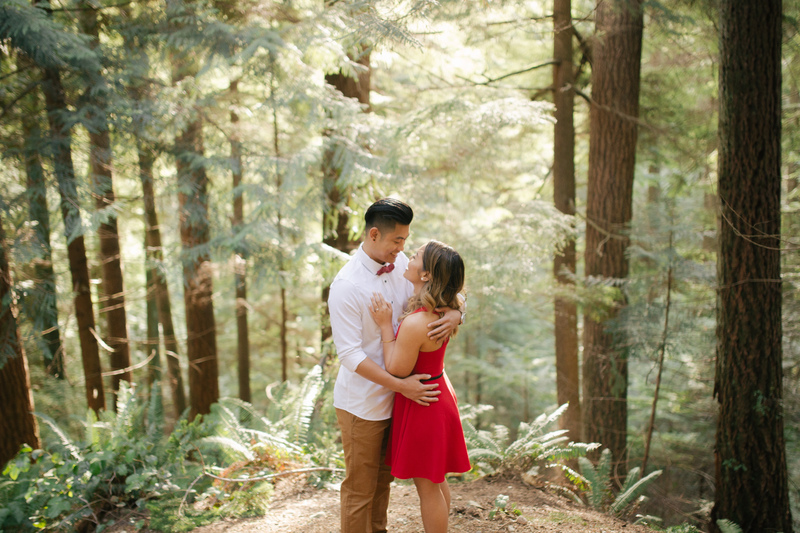 A playful red bowtie gives Mike that fresh pop of spring and helps make the couple look as if they go together without crossing over into sickeningly matchy-matchy territory. Summer – Spring will quickly spin into summer, leaving the frost of winter to become a distant memory. Continue to let the warm, sunny days be reflected in warm, bright clothing choices. Long, leisurely days translate nicely into the light, flowy fabrics for a casual, summer-soaked shoot. All the fellas out there will probably want to stay away from the darker button-downs in their closets, seeing as they can be much too heavy and formal for this time of year. Instead, opt for a fresh white button-down to expertly walk the line between “I’m taking this seriously,” and “I’m just trying to chill on this beautiful summer day.” However, don’t let the laidback summer vibes allow you to get sloppy. Make sure to set aside some time to properly prep your outfits, this means making sure they are clean and wrinkle-free. Wrinkled clothing does not read well on camera, no matter the season. Fall – Soon, the crisp days of fall will creep in as a signal to the world that the time has come to get ready for the much colder weather. Now is the time to break out those darker hues. A well-pressed navy button-down will never do you wrong when it comes to a colder weather shoot. Take inspiration from the fall foliage, which often lacks tons of obvious diversity in color, but is rich with subtle contrast. Mix timeless blacks, earthy browns, and olive greens in with your navy to create interest in your looks while remaining divinely seasonally-appropriate. A great way to accomplish this is by bringing a few warm layers with you. For example, Jamie embraced the monochrome of the season in her base outfit, but wisely chose a coat and scarf that introduce something new to the palette. Winter – When the last of the leaves have fallen and you can practically smell the soft dusting of a first snow in the air, layers are no longer an option, but a necessity. Again, think about using outerwear to introduce some color variation, or possibly as a way to add a little nonchalant edge to your photos, like Simran did with her red winter jacket. 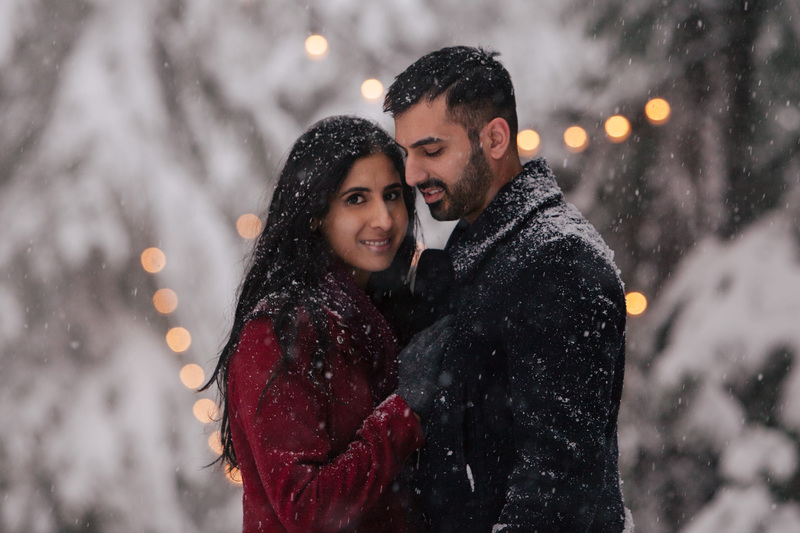 The more subdued ambience of winter does lend itself to a fairly formal shoot, but don’t be afraid to take a cue from Ravi and Simran by using a color that pops out of the snow. You can always remove the jacket if it’s warm enough and get a different look. Just make sure you don’t dial down the fancy too much, all your super comfy graphic tees should be left at home. Big logos are a no-go in warm weather as well as in cold (same goes for thin stripes). Spring/Summer – Bright, lively colors with an easygoing attitude. Fall/Winter – Dark and classic; less is more when it comes to contrast.